I was in a room with other people waiting to get a special type of spiritual massage. All of the attendants were doing other people so I waited. Finally, the session was over and some of the people got up to leave. I went to an empty bed, to wait for my attendant to come. The scene gradually changed and I saw Sai Baba come in. He came over to me and spoke so lovingly. We had a very long conversation. I could hear His sweet voice and see His soft, charming face. It was our Baba as we knew Him. I kept gazing in awe at Baba, saying over and over: "Baba I love You." He looked at me and said "You always say that. Only thing is you spend a little too much time on your face." I agreed and said, "Swami it is such a waste of time." I knew Swami was right I tend to worry over my hair and have chastised myself for spending too much time on hair treatments etc. I vowed right then to stop that. We continued talking, sitting together comfortably engaged in a very intimate conversation. I said, "Swami I've been here such a long time." (referring to earth life) Swami replied, "Yes a very long time." Then He said some other things which I cannot recall. He responded to something I said, can't remember what it was. But He replied, looking deeply at me with beaming eyes, "That's because you have so much bhakti." Then a man in the room and others who were watching interrupted our communion, complaining that there were so many other people that needed attention. 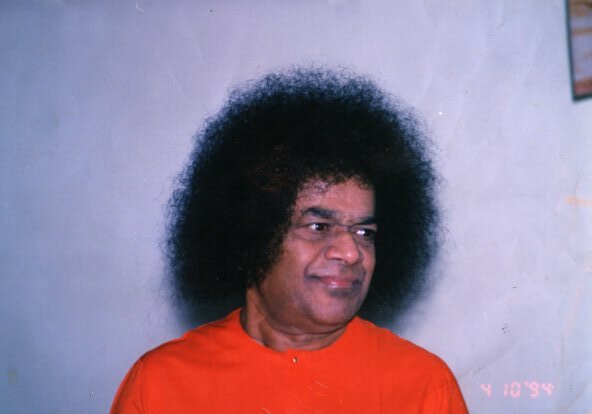 Swami got up and walked down to the end of the hall to help a man who was very, very sick. He had tubes coming out of him and was on a ventilator. Swami spent some time with the man. I came over and asked Baba if He wanted me to massage the sick man's feet. The sick man looked up and said, "I will be with you shortly." Swami shook His divine head and said, "There is nothing that can be done for him." Swami went on to another person. Finally, Baba looked around and said, "There is more?" We both looked out the door and there were rows of people in beds who needed help. Swami said, "All these people?" Then He stopped by a female devotee and spent time with her. I saw my daughter Kendra walk over to us and I started waking up. Oh! brothers and sisters, our beloved Lord Sai is always available and ready to assist us. Guiding our footsteps, bringing us closer and closer to our real home and real Self.